I recently realized that I had not written a close to this year’s cruise. It was a wonderful adventure for us both. We visited new places, met some fascinating people, and learned more about our vessel and how to care for her systems. We also learned about patience in dealing with mother nature. Our trip from New York was all about biding our time while offshore weather was rough and then pouncing on the next fair weather opportunity to make some progress further south: two overnight legs offshore. Very tiring but no drama. 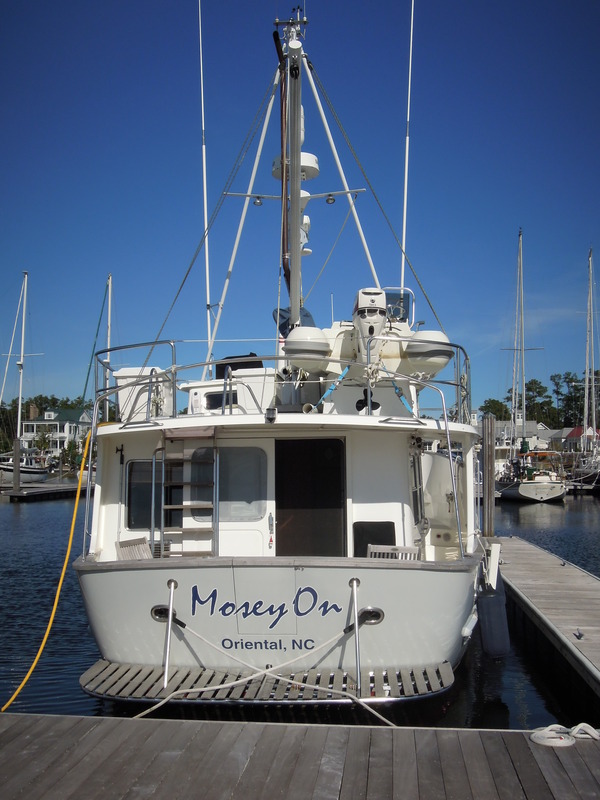 Mosey On is now tied securely in her slip here in River Dunes, NC. We have a significant list of regular maintenance items as well as some larger projects aboard to keep us busy through the winter months. Ship and crew will need this time for all manner of catch-up. Although Mosey On is tied to her dock, Colleen and I have continued to travel. Colleen has been out to Oregon to see her family there, while I went to Boston to see our son and his family. Last week we both were in DC to see our daughter and her family and Saturday we leave again for our Thanksgiving family gathering in Chicago. And in early December, we have a trip planned to Florida and friends to see along the way. In January, I’ve hopes of getting after those boat chores….